Hope's Cafe: Gourmet Gift Baskets Giveaway!! A gift basket is a wonderful idea for Christmas gifts. Whether it's a close friend, neighbor, or maybe your mailman, giving a gift basket is a lovely gesture. One of my favorite places to browse various gift basket ideas is Gourmet Gift Baskets. I previously reviewed a snack basket from GGB, and it was packed with all sorts of goodies! I was excited when offered the chance to host a giveaway for the Christmas Gift Basket Classic for all my readers. Whether you choose to keep this for yourself or gift it to a friend or family member, the recipient of this basket will be delighted! "One of our most popular Christmas designs, the Christmas Gift Basket Classic is an excellent choice for the home or office. Why? 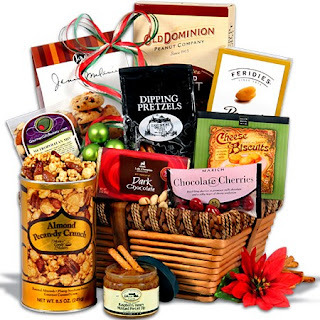 Each Christmas Basket contains a variety of award-winning gourmet snacks that appeal to a wide variety of tastes. With gourmet snacks including a chocolate covered cherries, dark chocolate bar, chocolate chip cookies, almond clustered popcorn, raspberry honey mustard pretzel dip along with pretzels and so much more! So, if you want to send a gift that everyone will love, send one of these delicious Christmas Gift Baskets!" One of my readers will win the Christmas Gift Basket Classic! I hope I didnt enter twice, if I did I am sorry I had to use a different computer.